Capcom Announcing Title For Xbox Japan? This image just popped up on the Xbox Japan website. 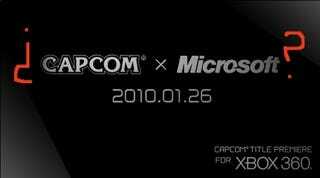 It clearly reads "Capcom x Microsoft," which is often short hand for collaborating. Below that is a date: January 26, 2010. The image also notes, "Capcom Title Premiere for Xbox 360". This could be an entirely new title ("premiere" carries that connotation, or it could be Capcom announcing that Dark Void is coming to the Xbox 360 in Japan. There isn't much to go on with this images, but it does not mention the word "exclusive". Even if it did state "exclusive", these days third party exclusives go multi-platform eventually and usually with more content.